Siempre Madrid: White or Red - who is going to join the whine club? White or Red - who is going to join the whine club? I must admit this is a preemptive strike on something that we have all been waiting for. As a teetotaler, I have no authority as my article's title would suggest, but I could not resist the temptation of a cheesy opening line. My apologies. The game is question is the one between us, Real Madrid and Liverpool- a double head to head fought over two legs ( similarities of the phrase with the game of football is purely intentional). I would like to draw attention to one of the most significant historical events and its rammifications in my motherland, India. This happened in 1805. For the people who slept through history class just like me, I am referring to the Battle of Trafalgar (http://en.wikipedia.org/wiki/Battle_of_trafalgar). More on why this significant later. Real have been the fastest off the starting blocks with respect to the European cup. Five consecutive cups in the 50's with a team comprising of perhaps football's first international superstar, Alfredo di Stefano meant that the rolling trophy gathered plenty of moss in our cabinet. Unfortunately, we have been doing badly of late. Our problem lies in our inability to get past scrappy teams. In 2004 season, the teams shifted to a knockout phase after the initial group phases which reduced the number of matches by four. And that's where a mercurial side like Real Madrid has problems. If we have a look at our history, it is common knowledge that we have never been relegated and our worst position in the Liga has been 11th out of 14 teams in a particular season. If we have a look at knockout competitions, it is where the smaller teams have a better chance of beating the big guns. A league phase tends to normalize results week in week out and it just is an indicator of a team's cumulative performance throughout a season. That is why you see how small teams end up upsatging fancy rivals in the FA cup. And that's precisely how it is romanticized in England. A neutral would always support an underdog. In the last five years, we have been very unlucky. We have faced Bayern twice, Arsenal, Juventus and Roma. We have never had the luck of the draw like how Milan has had plenty of times ( I have lost count of the number of times they played Celtic). But as the cliche goes, if we have to win a competition, we have to beat everybody. Thankfully, this year has not been a typical one after a winter break where we have shown holiday hangovers. A defeat at this stage of the competition and that too with a depleted squad would only mean adding insult to injury. We have been flirting with the lower end of the UEFA coefficients for quite a while and also, Spanish clubs not doing to well only compounds the problem (It is also dependent on how other teams from your league do in the continental competition). I am not a fan of this knockout garbage because it only lets in a below par team to the quarters (Fen vs Chelsea last year) due to them typically benefitting from the draw. If it were upto me, I would form a superleague with Europe's elite, but we all know pigs would fly on the day this happens. We need to do well in the competition so that we are atleast the top seeds in our pot in the following years. I will be happy if we can make it to the semifinals on a consistent basis. I am not a fan of Liverpool. They did set the stage on fire in the late 80's but that's about it. They have only challenged for the EPL ever since and done decently in the UCL (much better than us in the last four years) in the recent history of the tournament. I don't like it that most English commentators have grown up watching Liverpool play in that victorious era and that they have to heap that upon us with biased commentary. Atleast that is the image that I get sitting in my sofa in front of my TV. One look at the UCL telecast preferences only reinforces this. 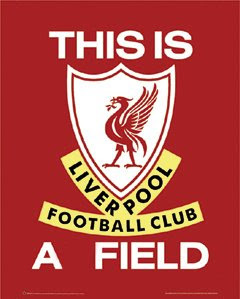 I have got tired of listening to trivia about "You'll never walk alone" or the more abused "Kop end" phrase. Especially when all these years they have been drawing at home to teams like Stoke. They have done much better this year. They were in the reckoning for the league and now, like us have to lick their wounds and hope that Europe turns out to be a happy hunting ground. They have two world class players in Torres and Gerrard and some good first team players as well. They play a long ball game more often than not and I have no idea as to how the headless chicken Kuyt finds his way into the team on a consistent basis. Why am I getting into a fistfight with them? I'll concentrate on the task in hand. Demanding football schedules have meant that teams have pretty much taken their foot off the pedal domestically. In the last few years, only Barcelona and Manchester United have won UCL the way it should be won- after winning the league. It hurts me when I see teams comfortably finishing fourth in the league and then pocketing the UCL. Something has to be done in this regard. How do we succeed in Europe? Pure attack rarely wins titles in Europe. More often than not, when a scrappy team faces a attack minded team, it is the defensive one that goes through as we have learnt the hard way. In a low scoring game like football, tactics and strategy are of utmost importance. Even when the marauding Barcelona did the grind after they went past Chelsea in 2006. Why did I choose to drop in a reference to the battle of Trafalgar earlier? The Spanish armada were one of the most feared navy forces in Europe. In fact, their defeat by the English navy paved the way for the East India company to establish a huge Indian base. One look at the TV programming in India just shows the step motherly treatment that the La Liga gets compared to the "greatest show on earth". TV revenues dwarf all other sources of income by sheer volume. In a way, this match is our opportunity to showcase our superiority over them on a global stage. This would only make the foray of Spanish la Liga into India/ Asia much easier- much like how the European forefathers wanted to establish a base a long time ago. Admiral Nelson did the improbable by not being orthodox in tactics. And that is where we have to learn from history. Liverpool fight as a team and this is where we have to break them. We have been experimenting with the long ball for some time now and what we seemed to have improved upon is effective counter attacking. Instead of an all out assault on Liverpool, we have to keep the ball away from their midfield. We have to reorganize our team into an offensive and defensive units- we attack in fours and defend in sixes- these must be our mininum numbers. As they are going to play Kuyt, we have to play Marcelo in the left back position as Kuyt will not be a major threat. The moment Liverpool splits as a team, they struggle to start attacks and resort to long balls- a tactic that will play into our hands. Capello had masterminded an offside trap with the forwards two seasons back. Essentially, then, one of the three- RVN, Raul and Robinho would stray offside but would not be involved in the passage of play. The defence would switch off and what was sold was a dummy with the offside character coming as a guest star later on to provide a deadly touch/ pass when onside. If you were the opposition team, it was like watching a horror movie- you think its all over and then a hand comes out of the ground! This is something that we have to resort to unsettle the defence- especially which is not too quick. If not anything, it will draw a couple of them out of their positions and only confuse them more. Defending set pieces have always been our weakest link and special attention has to be paid to that. I expect Torres to fail and Gerrard will not be in full fitness. I expect Benitez to field a 4-5-1 for both the legs. A score of two nil or more would be ideal. In the reverse fixture, we have to hold nerve- something that we have failed to do so for quite some time. This is our key to success. Hopefully, it does not cost us an arm and a leg, like Admiral Nelson. Here is my suggestion to neutralize the crowd in the second leg. I hope somebody sees this and uses it. YOU GUYS SHOULD KNOW BETTER ENGLISH! there's no doubt about it. its loserpool who's gonna join the whine club!